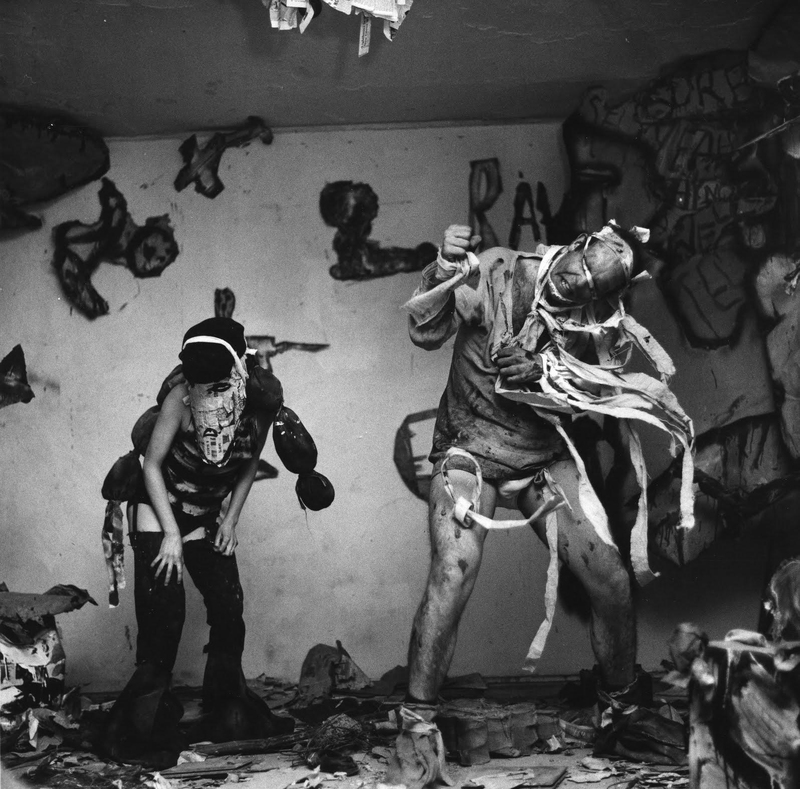 Pat Muschinski and Claes Oldenburg in Claes Oldenburg’s Snapshots from the City, performed during Ray Gun Spex at Judson Church, February 29, March 1–2, 1960. Here at MoMA, some of the dirt and grime from the Lower East Side has leaked in. In Claes Oldenburg’s “The Street,” the collages and assemblages he created at the dawn of the 1960s were made from the filth and clutter you might encounter when you leave the austere white walls of the Museum and saunter downtown to the gritty neighborhoods surrounding the Bowery. Of course, 50 years + later, the grime-laden collage pieces are now artifacts of one of the most remarkable periods in American art history. Oldenburg’s “The Street” was the result of the artist’s need in the late 1950s and early 60s to erase the line between art and life, to make art as funky and brutal and funny as life itself. He appropriated the squalor of downtown NYC into his work, then blew it all wide open when the tattered sculptural pieces became set pieces for his first performance: Snapshots from the City. As we have noted more than once: when art spills out over the edges of what is art and moves in impossible new directions, theater is a natural destination for these revolutionary forms that defy categorization. The Happenings of the early 1960s were exactly that: a kind of artistic seizure that shook up the rules and foundations of the acceptable. In “The Street,” Oldenburg created the proto-sculptural work that would become his trademark: “ray guns” (his comic / ironic motif) of every size and shape; scaled up found objects made of soaked newspaper and formed in wireframe; fantastically stylized streetsigns consisting of chewed up cardboard, etc. Somehow these seemingly discarded objects, which you might find sticking out of a trash can in the streets of New York, take on a mythic quality when inserted into the mercurial constructions of the Happening. Not exactly illusion, or the age-old suspension of disbelief, but something more akin to alchemical transformation, a metamorphosis of material and its origins when inserted into the totalizing effects of live theater. Standing in the pristine gallery at MoMA, where these magnificently-charged objects have been brought together again (with Vanderbeek’s rare film footage of Snapshots from the City flickering overhead), you can still smell the fire, smoldering after all these years from its initial combustion: the shock waves continue to resonate today.